I’d never thought of animal skulls as having much eye appeal, and I certainly never thought of them as beautiful. That is, until I got a look at Joni Ballif’s stunning skull creations. 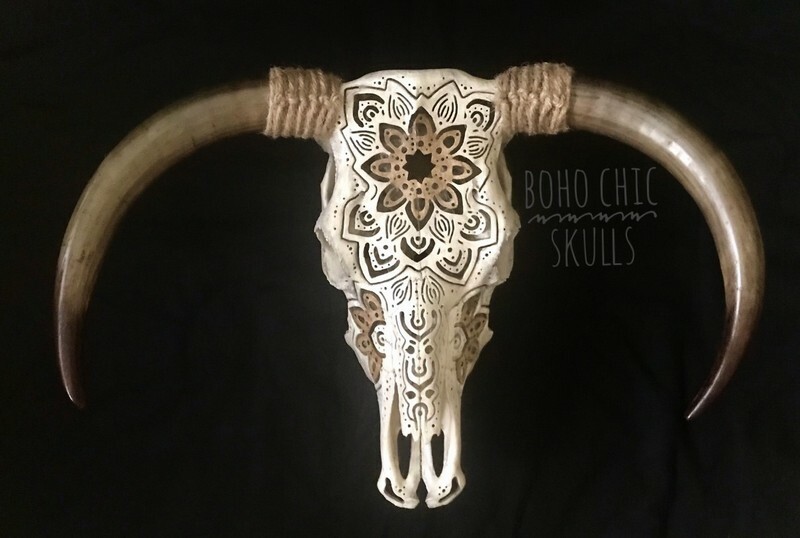 Joni is the creator/owner of a unique Utah-based business called Boho Chic Skulls. She takes dead animal skulls that she acquires from livestock dealers, pawn shops, slaughter houses, hunters, and from people selling their trophy skulls online, and then she carves them, transforming the skulls into intricate and delicate-looking pieces of art. Her foray into skull art and carving happened “somewhat by accident, really,” says Ballif. “My daughter was given a skull by my sister to hang on her wall. She has a bohemian themed room. Hence the name, Boho Chic Skulls. She wanted to carve the skull but was a little hesitant. I asked her if I could give it a try. So I made a design in the skull and started carving. From there I was hooked.” Before she knew it, Joni was searching for skulls everywhere. From helping to prep the skulls to offering useful input and helping out at booths, Ballif credits her family as being her biggest source of support. Amazingly, she’s self-taught and says she’s only been carving for about 10 months. I say “amazing” because to me each skull looks like it could have taken 10 months to create! “Lots of time, broken bits and broken skulls are all part of the process,” she says. When she paints, stains and carves her skulls, Ballif tries to incorporate the colors you find in Utah. And, since most of her skulls are purchased here in the Beehive, she feels that the local community and economy are benefiting from her business. About that business, she says that she’d like to be doing more commissioned artwork in the future, where people bring their skulls to her to be custom carved.